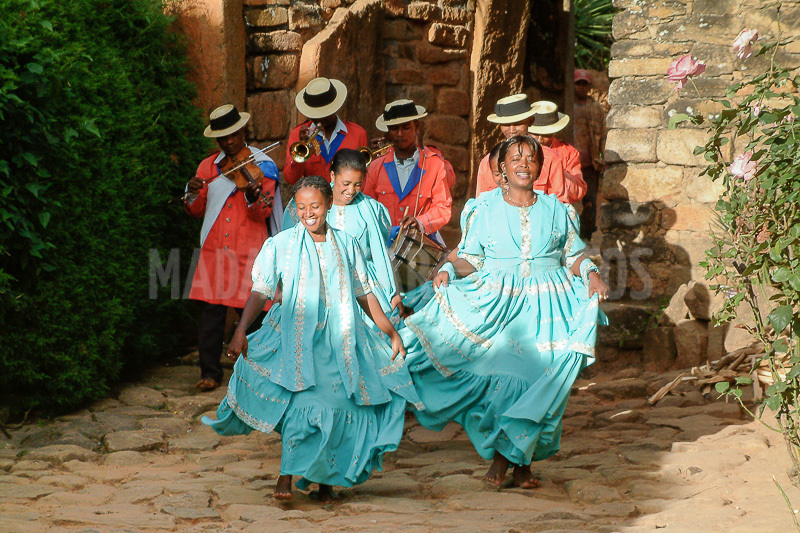 The Hira Gasy is a typical Malagasy folk art of the highlands. Its first name was the Hiratsangana, which literally means "a singing show that is performed and that one looks standing". It never required special installation and can be played on market places or on any vwasteland. The Hira Gasy exalts the virtues that everyone has to cultivate with examples drawn from "Lovantsofina" (Oral tradition) or everyday life, or the Bible. A moralistic spectacle, he attributes as much importance to speech as to gestures, music and dances. In order to maintain the attention and to ensure the correct reception of the message, the Mpihira Gasy put in a circle (Faribolana) in order to simultaneously take care of all the parts of the assistance. The men wear preferably red coats with other side black, and do not disdain to add braids. The women dress in long dresses. The orchestra includes, besides the percussions which ensure the rhythmic support of dances, violins, flutes, clarinets and brass instruments. The musicians of Hira Gasy are also a "show in the show" by their disarming virtuosity reminiscent of New Orleans and their sometimes unusual way of playing: violinists for example vigorously operate their instruments while the archer remains practically immobile, and the clarinetists prefer to blow by putting the reed on top. The speaker must know how to lead them... with the wand so that, at the second wanted, the meow of a violin who rarely knew the rosin or the martial rotation of "langoraona" (snare drums) corroborate his statements. As one approaches the dances, the tide of the brass is invaded. The dancers finally move. They adjust the "lamba" that they tied around the kidneys and take by two or three the front of the scene. Attention is drawn to those purple and dominating silhouettes which at first sketch a slight sway from one foot to the other. The look strangely absent indicates an intense concentration. And it is the great flight, legs split the air, arms describe geometric figures or mimic the flight of the bird, feet hammer the ground with a synchronization such that we forget that the din comes from in fact of drums. The jumps invariably end with a restoration in a half-kneeling position. The public exults and curiously the gods, no doubt brought back from their world by clamors, become men again. The sweat pearls, the jaws clench but the maintenance is always so proud. Because a Mpihira Gasy never bends, and this afternoon the recipe will be good.